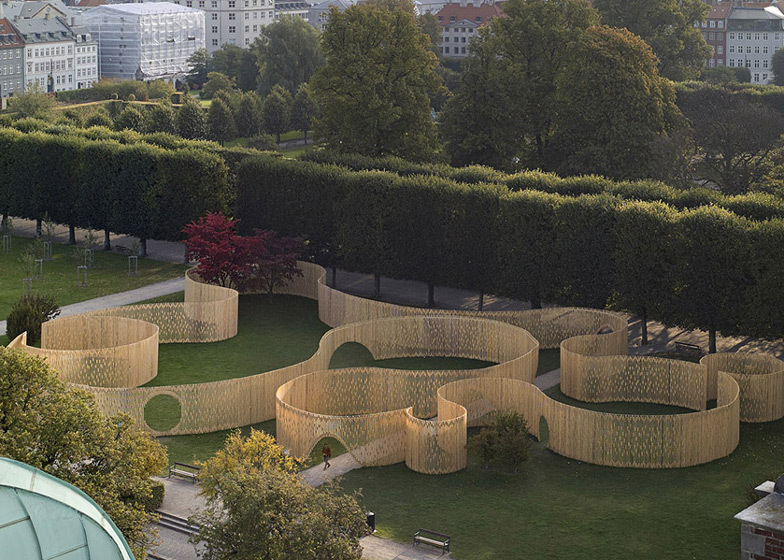 Dutch design studio FABRIC has installed a slatted wooden structure that creates a curvy maze in the garden of Rosenborg Castle in Copenhagen, Denmark (+ slideshow). 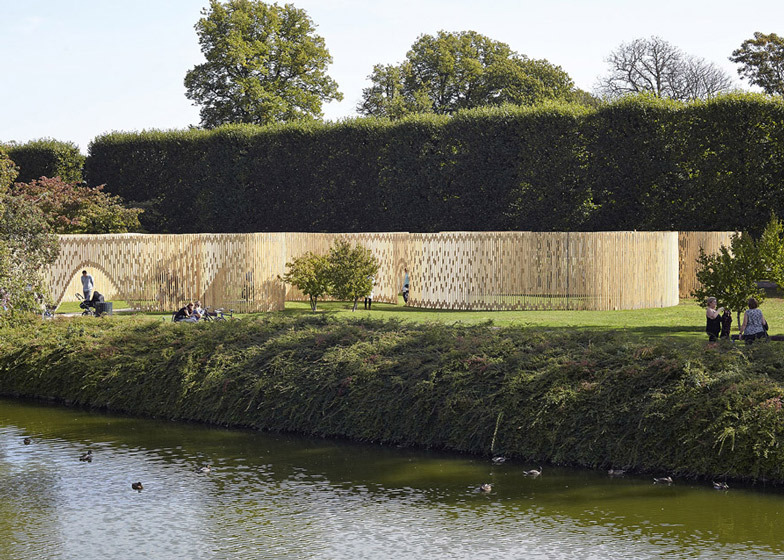 FABRIC won an international competition set by the Danish Architects' Association to design a temporary public pavilion with a small budget for a section of the Renaissance garden next to the castle. The designers used 2967 identical pieces of spruce to build a 308-metre-long wall, which is composed of ten intersecting circles of various dimensions arranged according to the position of exiting trees, pathways, statues and sight lines to the castle. The choice of material was influenced by the need to minimise costs, but also by the designers' intention of "stretching the understanding of the pavilion towards the most elementary architectural element in garden design: the fence." Curving walls form a maze-like environment that can be entered through circular or arching openings, with different heights for adults and children. 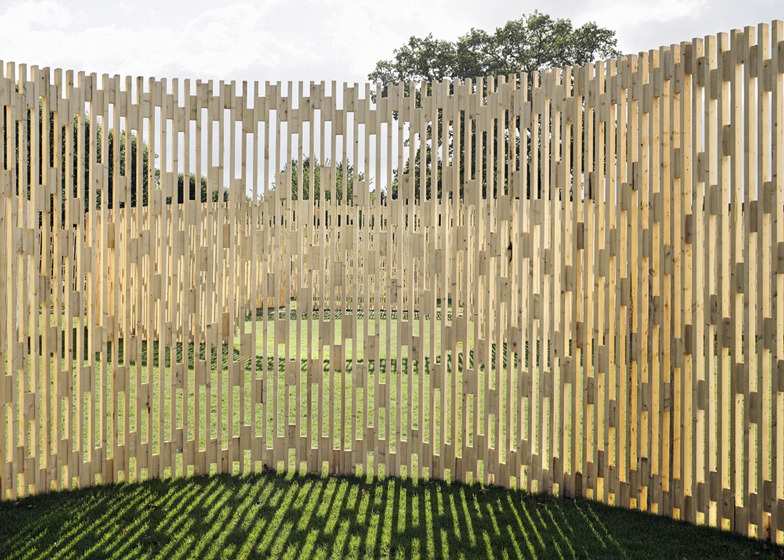 Smaller wooden pieces used to join the evenly-spaced vertical slats are distributed irregularly across the surface and produce a moiré effect that creates the illusion of movement to visitors wandering around the structure. The project's title Trylletromler is the Danish word for zoetrope - the cylindrical device with a sequence of pictures inside and vertical slits cut in the sides that creates the impression of a moving image as the cylinder spins. "When one thinks of a fence made out of sticks with narrow vertical slits arranged on a circular layout the image of a zoetrope - or 'wheel of life' - jumps to mind," explained the designers. The fence was constructed from one-metre-long sections that were connected on site. The untreated wood can be reused when it is removed. Photography is by Walter Herfst. 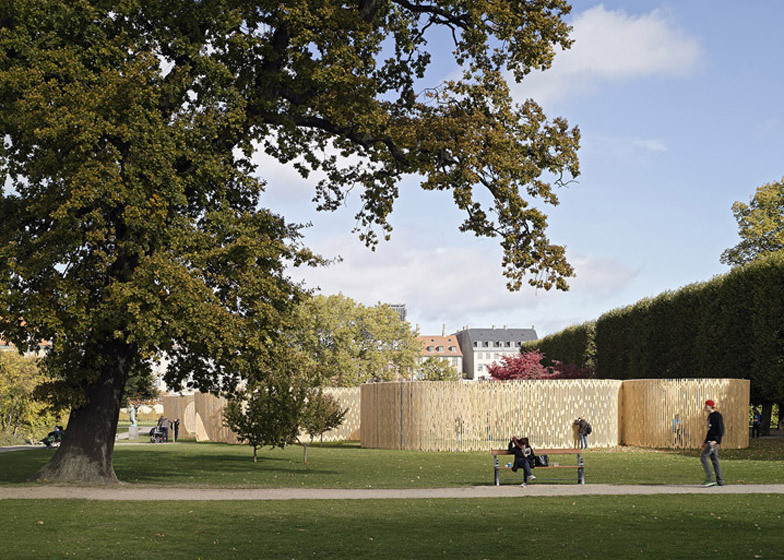 The Dutch design firm FABRIC (Amsterdam) has built a pavilion in the Kongens Have (ed. King's Garden) in Copenhagen. The design is named 'Trylletromler', the Danish word for zoetrope. This 19th century device activates an impression of movement within a still image. 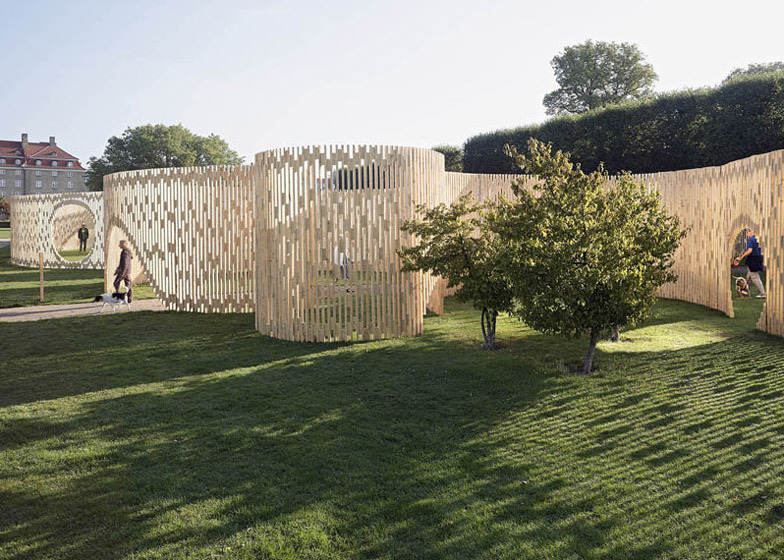 The pavilion is a result of international design competition issued by the Danish Akademisk Arkitektforening early this year, which was won by FABRIC. 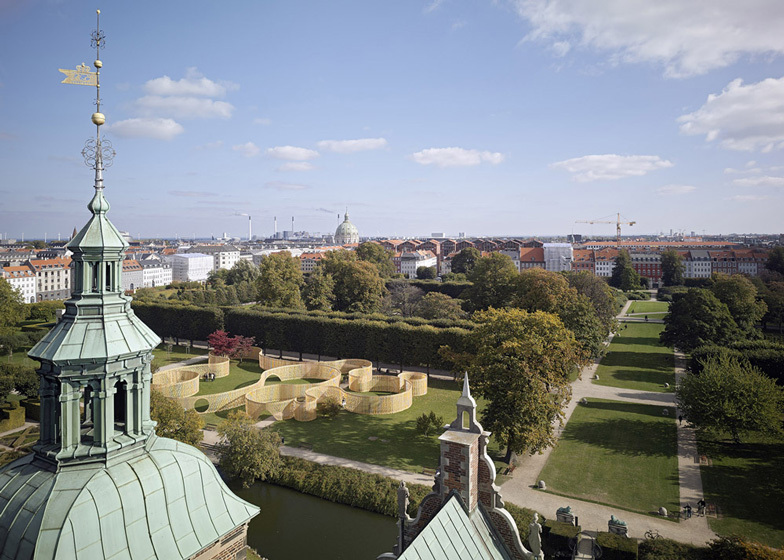 The Renaissance garden design of Rosenborg Castle is the oldest known example of garden design in Denmark. The design draws heavily on principles of Euclidean geometry. This language of absolute space was long regarded as the construction principle of the world. The architecture, urbanism and landscape design that were derived from it, were essentially aiming to create order out of chaos using absolute shapes: line, square, triangle, sphere and cone. In a later stage baroque elements were added, such as mazes and diagonal paths. Also Kavalergangen and Damegangen, two tree-lined avenues, were introduced. After these alterations the garden was never drastically changed. This classical representation of space was meticulously maintained until today. This is the context for the question to design a pavilion, which is accessible to all public, appears innovative in its spatial expression and is challenging by its idiom. While remaining removable the design had to be realised within a very limited budget. 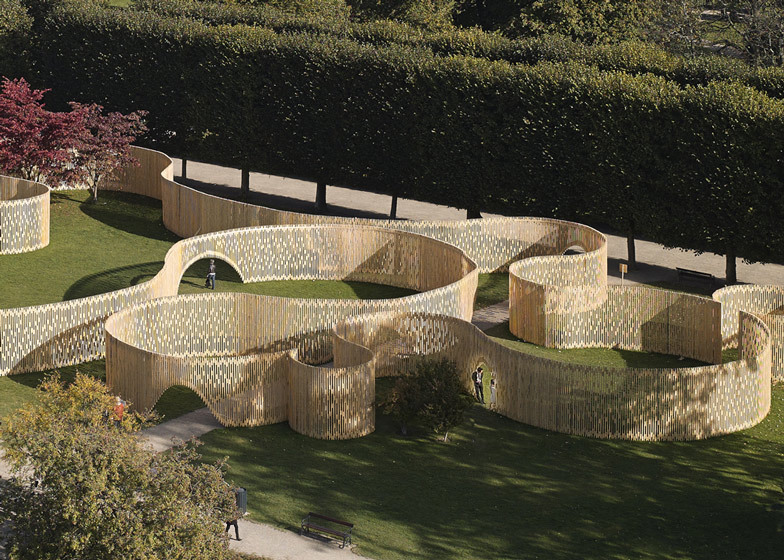 FABRIC therefore introduced a new spatial concept in the royal garden in Copenhagen by stretching the understanding of the 'pavilion' towards the most elementary architectural element in garden design: the fence. This new understanding of space provided by questioning strict order in the garden design and give way to ambivalence and hybridity is a 'blurring strategy' . This strategy addresses three independent paradoxes by provoking the notions inside and outside, by introducing a maze that is paradoxically transparent and by creating an illusion of motion. Secondly, openings in the fence create routes through the pavilion. Most openings in their appearance resemble a partly raised curtain, making the fence look very light. By avoiding openings on obvious routes on sightlines, visitors are forced to find their way through the sequence of circle shaped spaces. And not all the openings are accessible to everybody. Some openings only allow kids into the pavilion, escaping their parents gaze as they explore the pavilion. The fence so to say acts like a see through maze. Thirdly, the fence gives new meaning by its potential to create the illusion of motion via the so called moiré patterns while moving along the fence. 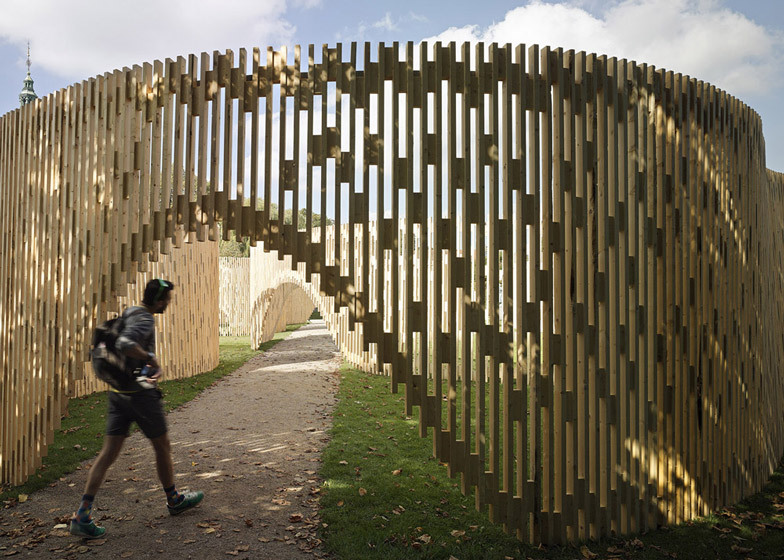 The fence is made out of three thousand standard pieces of Nordic timber, which are joined using an irregular pattern of wedges. The repetitive openings between the bars of the fence and their connections create a continuous moving image. When one thinks of a fence made out of sticks with narrow vertical slits arranged on a circular layout the image of a Zoetrope - or 'wheel of life' - jumps to mind. This 19th century device triggers an impression of movement within a still image. Based on these three principles an intriguing floor plan was designed using a composition of ten perfect circles. The plan design reacts to given circumstances such as the exit of the rose garden, the statue by the water, sight lines towards the castle, existing tree lines and the position of solitary trees. The maze like structure has in fact only one detail for all its connections. The entire structure built with 2967 standard pieces spruce of 38 millimetres thick and 68 millimetres wide. The narrow side of the uprights is placed forwards, while the cross-links are made of the same wood rotated ninety degrees. Each cross-link has a height of 200 millimetres and is planed under an angle on one side, so a circular structure arises. The fence is prefabricated in segments of one meter, which are screwed together at the site and anchored into the ground. The result is a 308 meter long winding wooden sculpture. Because the spruce is used untreated, all the material can be fully reused after the deconstruction of the pavilion. The spatial quality offered by the pavilion is supported by the many rooms and directions users can explore. According to the jury the project therefore demonstrates the best desire and ability of architects to challenge and give new meaning to the concept of the pavilion. "We are very pleased that we can support this initiative to have a pavilion – after international model – build here in Denmark for the very first time. Both the Danish and international public will have the opportunity to see alternative and innovative solutions for the construction industry. This is fully in line with our aim to support projects that promote the architectural profession from development and interaction with the community", says Bo Rygaard, CEO of The Dreyer Foundation, which has supported the competition. The use of the pavilion by the visitors confirms the jury in its judgment. King's Garden is opened daily from sunrise till sunset. During that time there appears to be no moment when people are not using the pavilion. The fence proves to have a great attractive effect. People wonder amazed through the winding structure. Kids immediately recognise the potential of this enormous playset, but also adults take full possession. Whether it's romantic couples, a club of bike messengers, runners, people walking their dogs or people who enjoy their lunch outside everyone finds a place in this endless fence. A fence thus that no longer separates but also connects, unites and astounds people. 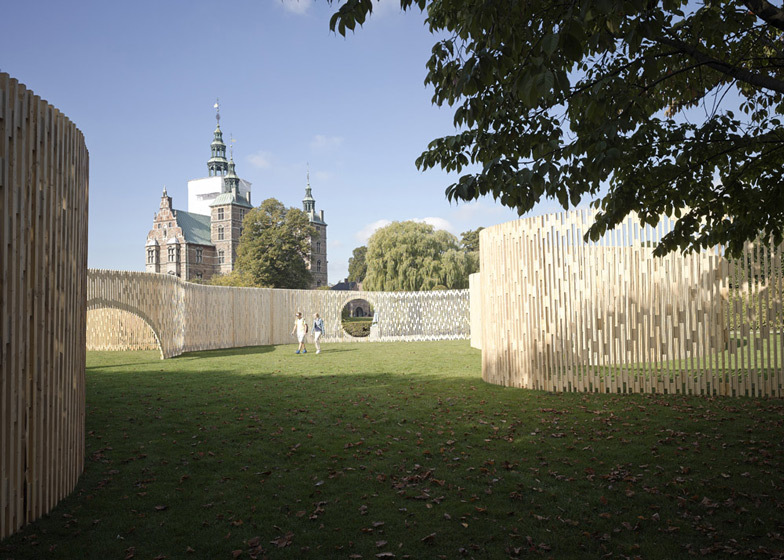 A fence that stretches the concept of a pavilion and above all marks the launch of a new ambition to organise this yearly event in Danish architecture.